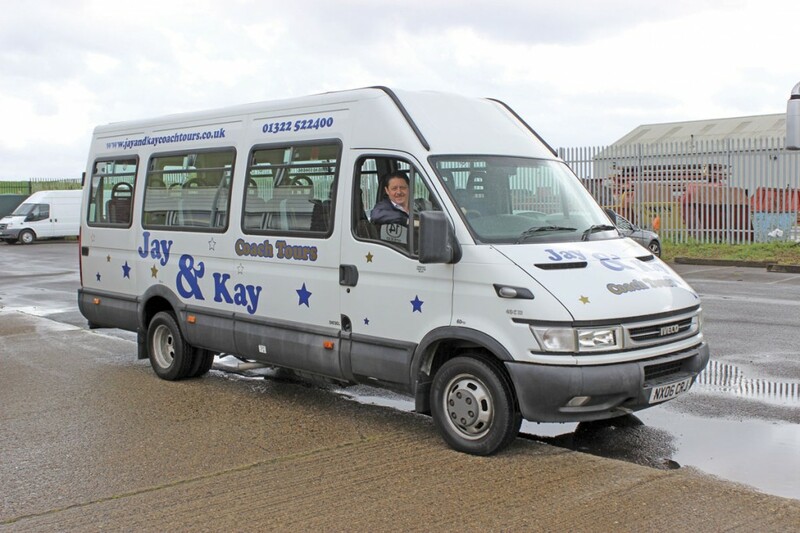 Just over a decade after starting in business, Crayford based Jay & Kay Coach Tours have a fleet of six modern coaches, four of which were bought new, and are having to further expand their offering to keep up with demand. They don’t do school contracts, they don’t work for tour companies with no coaches, private hire probably accounts for less than one percent of their turnover and the other 99% of their work is self generated. 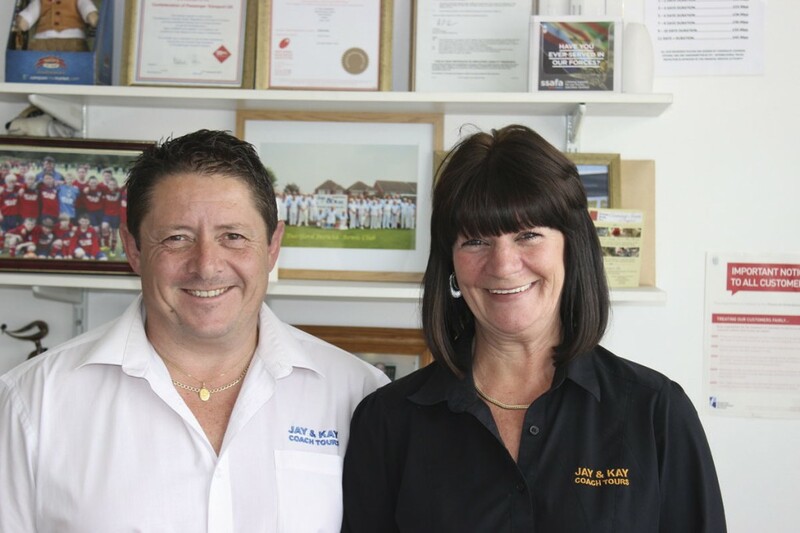 Karl and Jackie Brazier told Stuart Jones the story of how they have built up the business and thrived despite the recession. 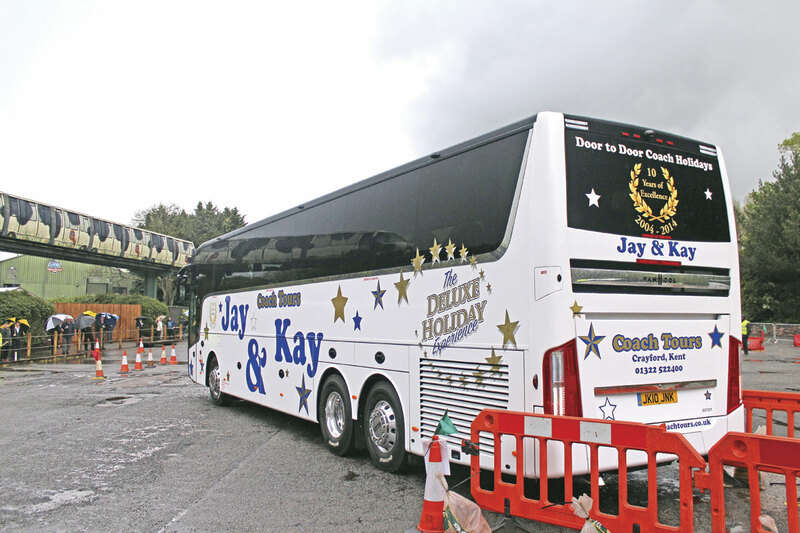 A good many coach businesses were started by people whose previous experience was of driving coaches. Some successfully make the step up to running their own fleets and unfortunately some don’t. Karl Brazier had a good enough plan along with the determination and the team to make it happen. He had considerable tour driving experience having driven for both KM of Barnsley and GeeVee Travel from the 1990s and his father had at one time run a small coach company of his own. What started him on the path into operating himself was meeting Jackie. Karl was driving a tour to Warners’ Sinha Warren site and Jackie worked for the charity Age Concern and was taking a party there. They got on and Karl moved south to be with her. Once he had met her he didn’t want to go on tour any more so he took up a job with The Kings Ferry, but travelling from Crayford to Medway to pick up the coach to start his commuter run meant that he was doing too many hours. After a year he changed again to driving buses for Metrobus from its Green Street Green depot in Orpington, which he hated, but needed the money because they were living in a rented flat and ‘didn’t have a bean.’ After a while they scraped together the money for a house deposit. By this stage, Karl was already planning to start his own coach company. He had developed the idea because he noticed that nobody locally was offering door to door coach holidays. He decided there was either a reason why nobody was doing it or an opportunity for it to be done. He discussed it with Jackie and she was dead against it, though she now says she’s glad he did it anyway. It was a big move taken in small steps. Firstly he visited the local Council and nearby libraries to confirm that there were enough people in the area likely to want to use his services. His first two tours ran in 2004, both visiting the Nethway Hotel in Torquay. The first departed on 1 June and in the November he put on a Turkey & Tinsel break. Both were undertaken during holidays from Metrobus where he continued to drive, and because local operators would only rent him a coach with a driver, he went back to GeeVee Travel where Gordon Clark was very helpful and hired him a coach on its own. Unaccustomed to the door to door concept, people rang up and asked what the catch was. Karl assured them there wasn’t one – ‘we pick you up by taxi and drop you off afterwards.’ He admits that he didn’t get the advertising right to begin with. There was just a small box in the paper when there should have been more of a display advertisement, but, backed up with door to door leaflet drops loadings of 36 on one trip and 38 on the other were achieved. Karl drove, Jackie went and acted as courier and together they served packed lunches they had made themselves. 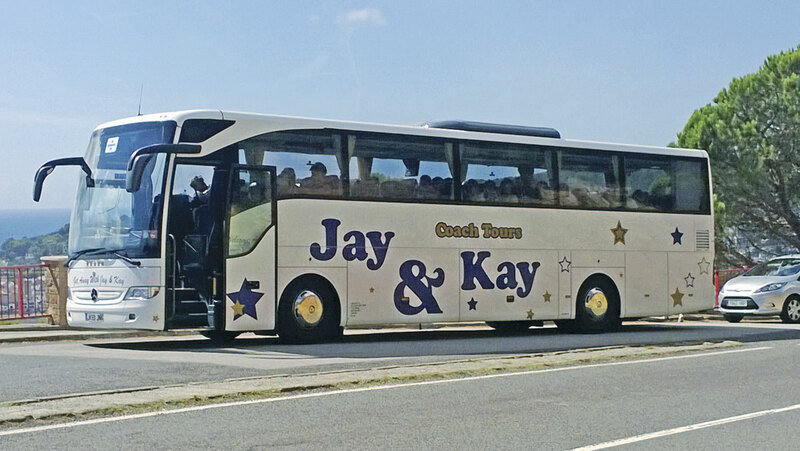 From the outset the name Jay & Kay Coach Tours was used because of J for Jackie and K for Karl, although Jackie admits she still gets called Kay while Karl gets called Jay by some people who assume that the reference is to their names rather than initials. It all went well, possibly better than Karl expected, so the following year five trips were advertised. Karl didn’t tell the management at Metrobus, where he was still driving, though his colleagues knew. Karl stepped up the promotion visiting sheltered housing schemes and old people’s clubs taking photos along to show them and making presentations about the holidays. A considerable slice of luck was a friend of Jackie, Diane Coleman, offering to sell the holidays through her travel agency for a fee. This was a much preferable arrangement to customers having to visit the couple’s flat to pay for their holidays. Sales went so well, because of the door to door element and the service provided that the number of tours had to be increased to seven, Karl admitting a little sheepishly that he had to ‘pull a sickie’ to cover one of them. Only after the 2005 season had gone so well and proved that it was what people wanted did Karl start planning a greatly expanded programme with 20 departures. Jackie continued to work at Age Concern but Karl handed in his notice to Metrobus effective from February 2006. Driving buses had been ‘a massive culture shock’ after 15 years of tour driving and he counted down the days to leaving with ‘The End’ marked in big letters on the wall calendar in the flat. Part of his original thinking was that he could offer his services to GeeVee Travel in the weeks he wasn’t driving on his own tours. 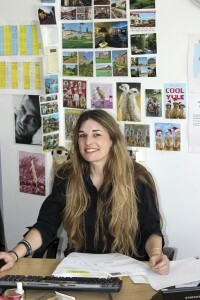 They say there is an opportunity in every challenge and that was certainly the case when, in March 2006, Diane, who had been selling the tours from her shop, told Karl he was going to have to get his own office because her staff had become so busy selling Jay & Kay holidays that they couldn’t get on with their own work. Over the road from Age Concern on the Parade, Crayford Way, was a vacant ground floor shop unit. Jackie knew it was a busy street with good footfall and short term parking so that people could drop in so they took the plunge and took a long lease on it. Lisa Popely was recruited to take bookings using the manual system they used initially. The shop, which remains Jay & Kay’s main sales outlet today, opened in the July and was busy from the off. The 20 departures originally planned doubled to 40, such was the demand, with five, six, seven and eight day tours offered, all of them driven by Karl personally. Later that year a very significant event for the company occurred with the purchase of the first coach of its own. This was a 1996 Bova Futura FHD bought from APT Travel of Essex. He had the heads-up that it was a good coach because Jackie’s mother and father are in the same Corps of the Salvation Army as Trevor Thorn. After seeing it he paid £45,000 for it. There was soon another challenge to face, because although Karl had driven every tour thus far, he knew he would soon need another coach and driver. It was a double difficulty because not only did he need someone who could live up to the standards he set; he also needed to keep the passengers happy who were used to travelling with the boss. He remembered meeting Phil Thomas, a driver with Crusader Holidays, some years earlier on the Isle of Wight and being impressed with him. Seeing him again in Llandudno he was of the same impression and, without him knowing, asked his passengers what they thought of their driver. Soon after he saw him again on the Isle of Wight and offered him the job. Among Phil’s questions was, ‘What will I be driving,’ to which Karl had to reply, ‘I don’t know, I haven’t got it yet.’ Despite this he was persuaded to join later that year and though a few people did complain initially that Karl wasn’t driving them, Phil soon won them over. The vehicle purchased for Phil was an 02 plate Bova Futura FHD, then only four years old, from Moseley in the South. He went down ‘just to have a look’ and came back having bought it for £125,000. ‘It was a lovely coach ex Roselyn of Par,’ said Karl. All three of the first employees taken on are still with the company. Phil, Lisa Popely who is now the Shop Manageress and Rob Worley, a former APT driver who joined in 2007, have stayed with the business. 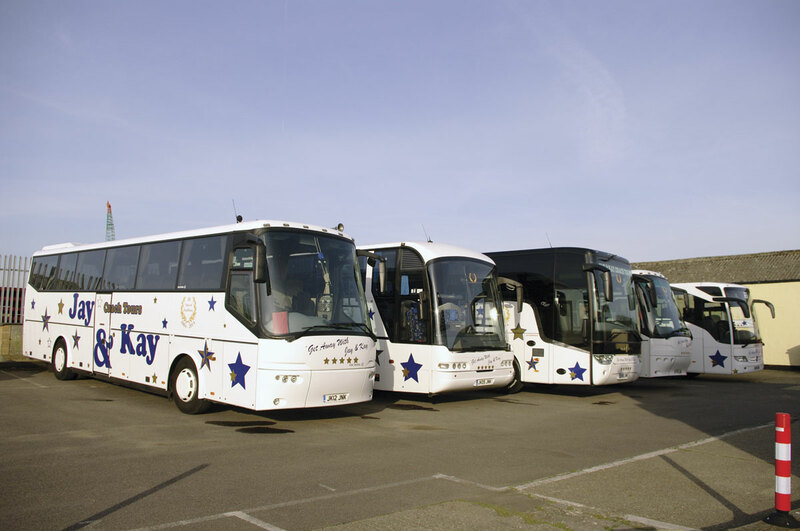 The tours continued to develop through 2007, when the fleet went up to three with the arrival of an 03 plate Futura FHD for Rob, and Karl thinks it was in this year that the first continental destination was offered: Lake Garda in Italy, though the operators licence held had been a continental one from the start. Karl had held a road haulage CPC since the late 1980s and later took his PSV qualifications, initially to enable him to be the licence holder for his father’s business. The following year a new string was added to the bow when Jay & Kay started doing day excursions. There was a strong tradition of excursions locally that wasn’t being met, but Karl was reluctant to do it because he wanted to stick to tours. It was Jackie who said, ‘We’re not here for us, we’re here for the public,’ and got her way. She was right too! Around 20 were offered n the first year and though they went quite slowly to start with, the effort put in on honing the pick up routes eventually paid off. It took a lot of fiddling with them before they got it right, with some having to be dropped, but the end result was four separate routes including one ‘express’ route which generated good regular custom. Today this element of the business involves around 250 departures annually representing around 10% of the company’s turnover. After running the three Futuras, there was a temporary change of direction in 2008 with the purchase of Mercedes-Benz O.404 Hispano Vita from Westbus that grew the feet to four. It proved troublesome because once it got warm it would lock you out of gear, until after a year of problems that lead him to lose faith in it, Karl took it to a truck dealership where an old engineer spotted the problem straight away, a thin metal ring within a valve, which had also been an issue on trucks. Attempts are made to attract younger passengers. As an example, the company has started running weekend breaks that leave at 14.00 on a Friday afternoon, returning on a Sunday evening. These sell well and enable anybody who is working to participate while only taking a Friday afternoon off work. Day breaks to shopping centres and markets do carry more younger people and help to encourage them to try a weekend break. There are school holiday zoo trips but Karl admits that it is difficult to encourage youngsters. 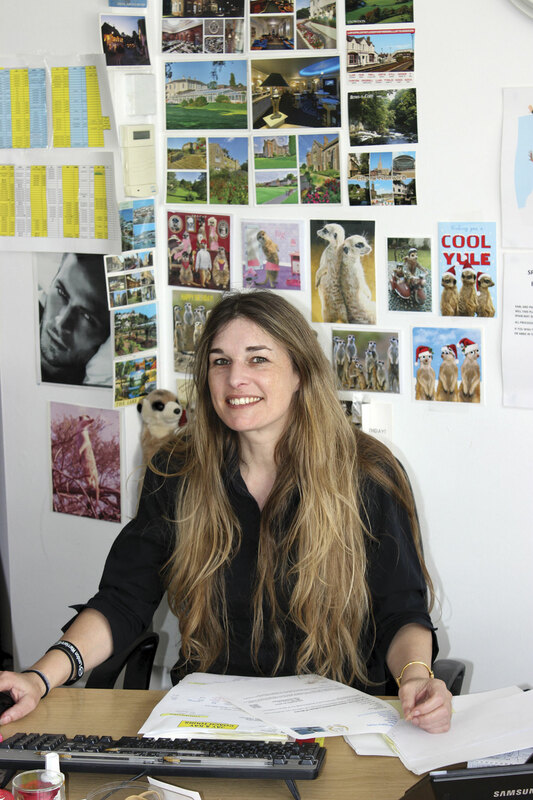 To help promote the holidays, 15,000 full colour brochures are printed for the year, of which 12,000 are distributed through a customer mail-shot. There are also two separate smaller runs of excursion brochures, one for the Spring/Summer and another for the Autumn/Winter. ‘The Roeville system enables you to group people who do different things. It’s pointless sending day trip brochures to people who don’t do day trips,’ said Karl. Going computerised was a good decision, but it was followed in 2009 by one that, though made for all the right reasons, could have had very serious consequences for the company, and might well have stopped them achieving the position they are in today. ‘It was our worst decision ever’, said Karl. 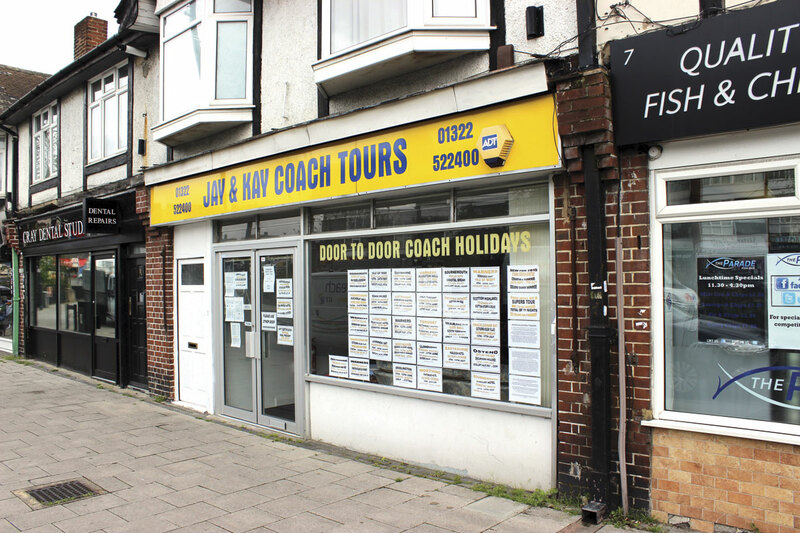 ‘We opened an additional shop in Swanley, took on people to staff it and signed a three year lease.’ It spectacularly failed to attract people in, even people in Swanley still went to Crayford to make their bookings. ‘We had to get out of it quickly or it would have sent us skint. We were just pumping money into it.’ Fortunately they managed to negotiate a way out of the lease, but it was a salutary lesson. 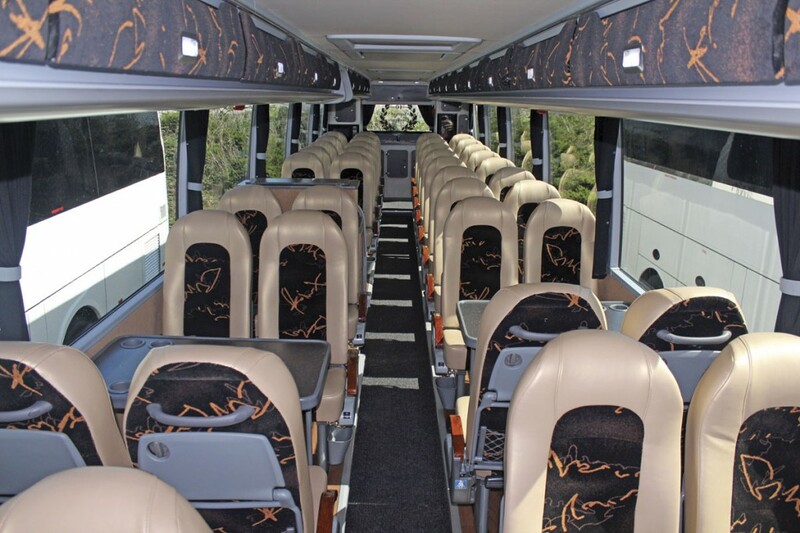 In addition to the four new coaches, a 2005 Neoplan Euroliner 49-seater and a 2008 Irizar PB bodied Scania with rear servery are also operated, although it is the intention that the Neoplan will be sold shortly. 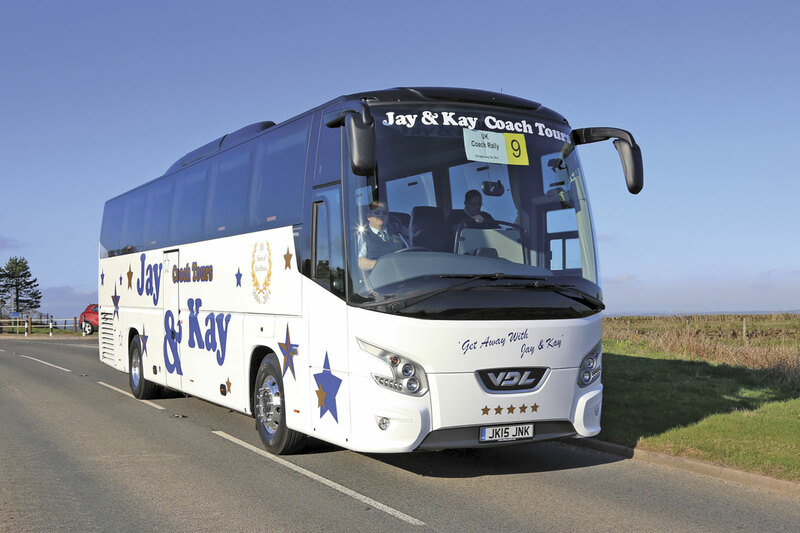 The Van Hool was bought for the launch of Jay & Kay’s premium brand, the Deluxe Holiday Experience, which promises additional legroom, hostess service, complimentary packed lunch on the outward journey, free hot drinks and bottles of water plus magazines and newspapers to read. Everything on the itinerary is included. This year there are 15 Deluxe UK and Continental departures within the brochure between May and November varying in duration from five to 12 days. They carry a premium of between £40 and £50 over standard tours which often visit the same destinations and are selling very well. 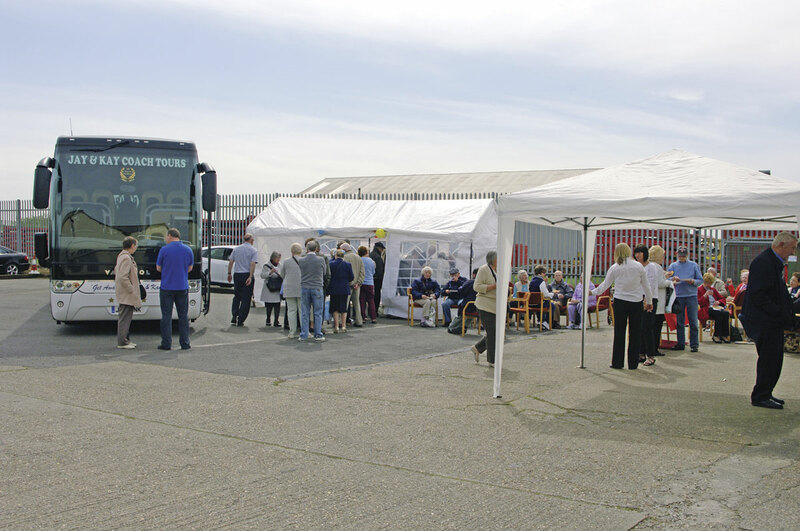 When the new Van Hool was purchased, an open day was held at the Erith depot to promote the arrival of the new coach and the launch of the Deluxe Holiday Experience. A coach ran from the shop and the main pick up point in Bexleyheath to Erith and special on the day offers were promoted. Though the staff teased him for arranging it because they thought it would be a waste of time, over 500 people turned up and an impressive £22,000 of business was done on the day as a result. Something under consideration for the future is a higher capacity coach for excursions, because they sell out so quickly. Karl’s thinking is that although for tours the number of seats sold is normally around the 40 mark, there are often times when another 20 could be sold for excursions. He says a double deck would be no good because a lot of the clientele already struggle to get up three steps on a coach. Whatever it is will need to be toilet equipped. ‘Even for Southend we have to have a toilet because if we don’t have one there will be moans, even though it is never used,’ said Karl. Today there are four people working in the shop, as well as Jackie, though Karl is usually in the separate office at the yard. 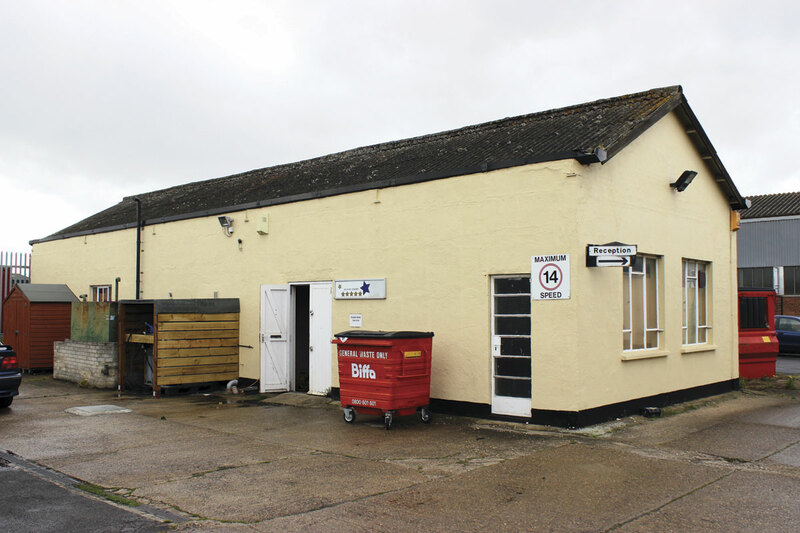 After a long time looking, offices and a yard were found four years ago around two miles from the shop on the Darenth Works Industrial Estate at Erith. It’s a secure site and there are washing facilities as well as sufficient parking room. Only day to day maintenance is done here as all servicing is undertaken by Richard Brooks at Brookline Coaches, ‘one of the best fitters I’ve ever met. He’s a bus and coach man through and through and I think it makes a big difference,’ said Karl. 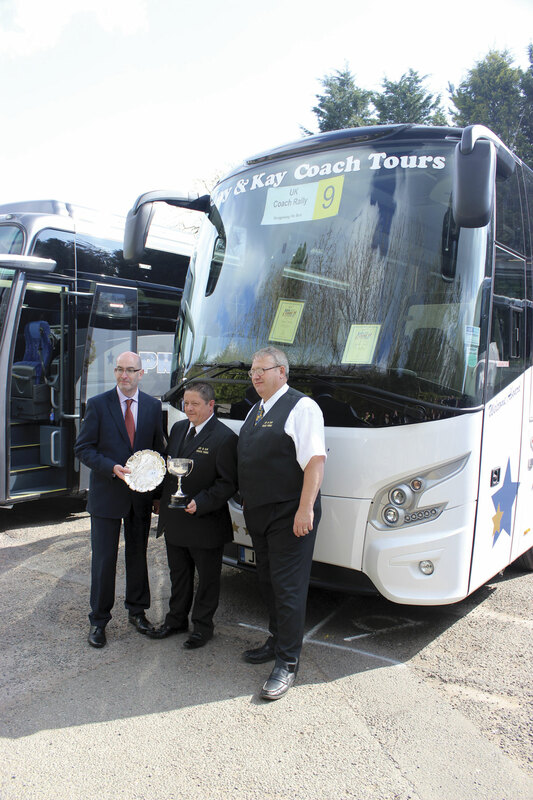 Karl also mentioned former customer, Chris Austin, affectionately known as ‘Blakey’ who helps out in a variety of ways including cleaning coaches and assisting with promotions and brochure distribution. Karl told me that sorting out all of the taxis needed was ‘a job and a half’. The company spends £140,000 a year on taxis to pick up and drop off customers, and has to pay more for being billed monthly. In an effort to reduce this bill he bought two Iveco Daily minicoaches, using up the final two of the eight discs held on the licence. 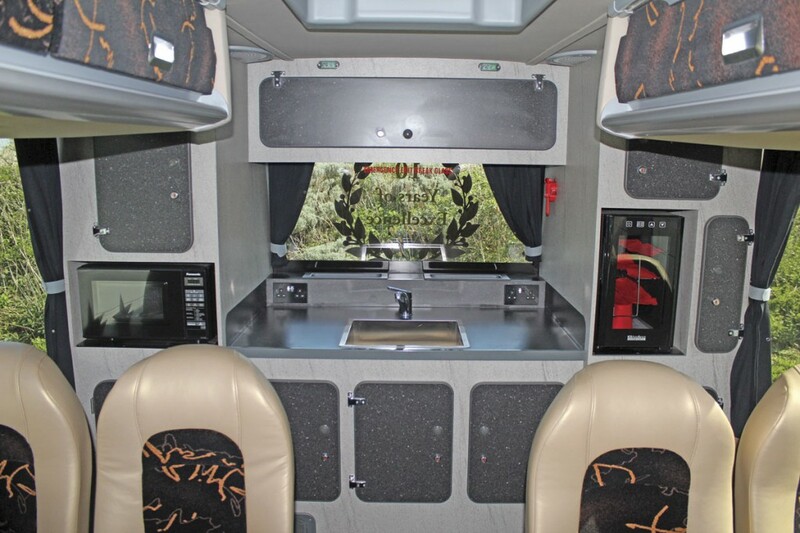 One of the minicoaches is to quite a high coach specification, but people accustomed to taxis complained and as a result they are now rarely used for this purpose, though the higher specification example is used sometimes on more lightly loaded tours. 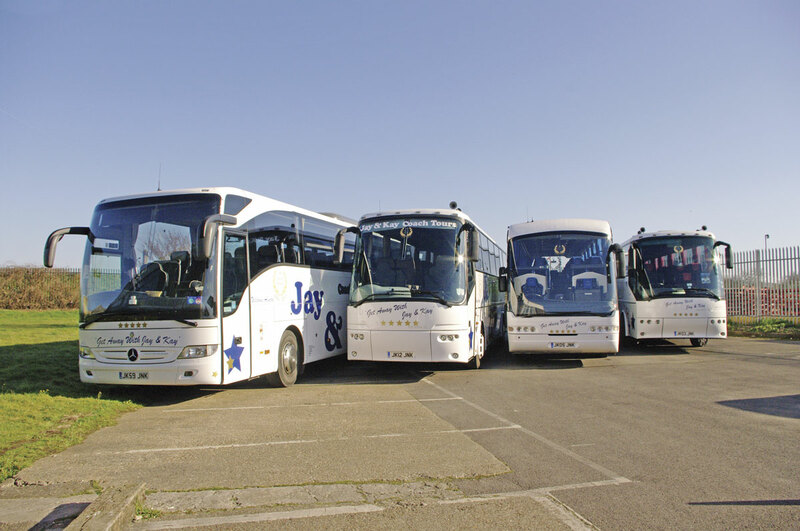 They have, however, proved quite popular for private hire, something the full sized coaches in the fleet do very little of, and they are also used to transport Erith and Belvedere FC, of whom Karl is a Director and sponsor. The company does shy away from stag and hen nights. 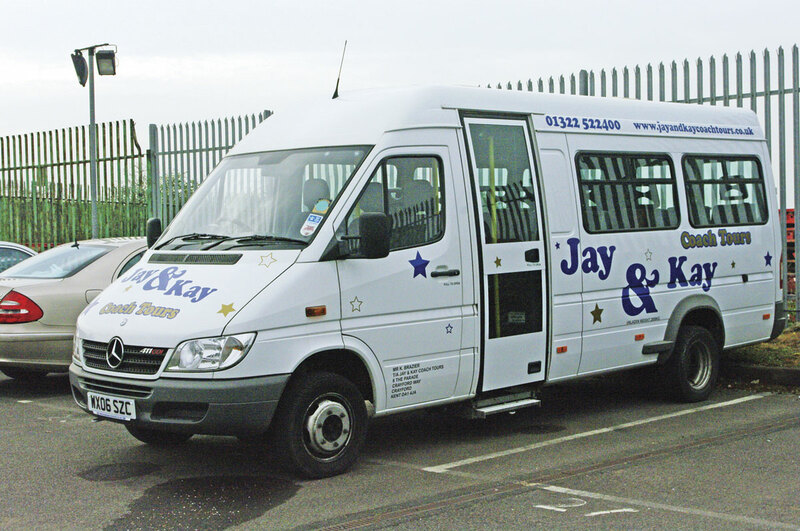 Asked whether Jay & Kay had done any broadcast advertising, Karl said that they hadn’t because they only had a small catchment area of about a ten mile radius and as they are on the edge of both London and Kent they would have to advertise twice and get coverage in too wide an area. However, they do advertise in local newspapers and occasionally spend a week promoting in a shopping mall, which is the most successful form of advertising that they do. 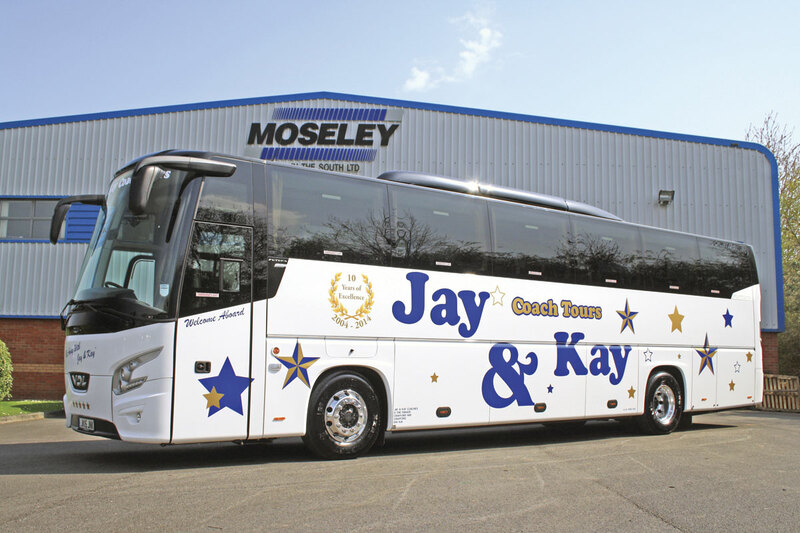 Jay & Kay have become enthusiastic supporters of the UK Coach Rally in recent years after Karl first attended at the last Peterborough event in 2013. He won the Best Small Operator and the Best Bova trophies on that occasion, which coincidentally are the same two awards he won this year. Karl also enjoys going to award nights, ‘to meet people rather than to win awards.’ It’s worth its weight in gold to me because you meet people who would help you and who you would help. It’s much easier to pick up the telephone to people that you’ve met.